Charles Fisher "Charlie" Ritchie was born June 13, 1900, in Pasadena, Los Angeles Co., CA, and died April 13, 1953, in Saint Louis, MO, at age 52. He is the son of Charles Hamilton Ritchie of Detroit, Wayne Co., MI, and Arabella "Bella" (Fisher) Unknown of California. Charles wrote an engineering thesis at California Institute of Technology in 1922. Dorothy Howe Mirick was born March 8, 1896, in New York, NY, and died December 23, 1943, at her home in Trona, San Bernardino Co., CA, at age 47. She is the daughter of Mark B. Mirick of New York, and Mabel Grant of Illinois. She graduated from Cornell University with an A. B. Degree in 1919. Mark B. Mirick (born about 1853) died August 27, 1915, in Kings Co., NY. Mabelle G. (Murray) Mirick was a widow and living with her brother in El Paso, TX, in 1920, along with Dorothy H. Mirick. Charles Fisher "Charlie" Ritchie and Dorothy Howe Mirick were married about May, 1928, in California. Carol Fisher Ritchie: Born June 16, 1929, in Los Angeles Co., CA; Died about 2017 in Unknown (about age 88). Married about 1954 in California to Gabriel Charles Campagnet: Born July 15, 1926, in France; Died July 11, 2008, in South San Francisco, San Mateo Co., CA (age 81). She graduated from Swarthmore College, Swarthmore, PA, in the Class of 1950. Douglas Grant "Doug" Ritchie: Born October 15, 1935, in San Bernardo Co., CA; Died about 2017 in Unknown (about age 82). He was a mechanical engineer for Wiancko Engineering in Pasadena, CA. Graduated in 1957 from Caltech with his BSME. He was Chief Engineer of transducer products at Microdot Inc. in South Pasadena in 1968. In 1974 he was Operations Manager of Ailtech in the City of Industry, CA. In 1977 he was appointed Vice President of Engineering of Konigsberg Instruments, Pasadena, CA. Married June 8, 1957, in Los Angeles Co., CA, to Margaret Louise A. Wright: Born December 11, 1934, in San Francisco, San Francisco Co., CA; Unknown. Charles Fisher "Charlie" Ritchie then married a widow, Elinor Agnes (Close) Cushman. Elinor Agnes Close was born March 5, 1901, in New York City, NY, and died December 6, 1985, in Escondido, San Diego Co., CA, at age 84. She is the daughter of Ralph Tompkins Close (1872) of Connecticut, and Margaret Godfrey (1875) of New York. Elinor's mother had the last name of Murray in 1954. William Reynolds Cushman Jr. was born July 22, 1899, in Portsmouth, NH, and died November 16, 1942, at home on Lincoln Avenue, Escondido, San Diego Co., CA, at age 43. He is the son of William Reynolds Cushman Sr. and Marie Caraher. William Reynolds Cushman Jr. and Elinor Agnes Close were married about February 10, 1932, in San Diego Co., CA. William Reynolds Cushman Jr. and Elinor Agnes (Close) Cushman were living in Escondido, San Diego Co., Ca in 1942, when William died. After William Reynolds Cushman Jr. died, Elinor Agnes (Close) Cushman married a widower, Charles Fisher "Charlie" Ritchie. Charles Fisher "Charlie" Ritchie and Elinor A. (Close) Cushman were married about December 28, 1944, in San Diego Co., CA. Charles Fisher "Charlie" Ritchie and Elinor A. (Close) (Cushman) Ritchie had no children. Dorothy Howe Mirick was born March 8, 1896, in New York, NY. On Wednesday, May 18, 1898, Charles F. Lemmon was conferred the degree of D. D. S. at the University of California College of Dentistry, Berkeley, CA. Maxwell's Los Angeles City Directory and Gazetteer of Southern California 1898 shows: Lemmon Arabella (widow J. W.) r. 2120 Oak. Los Angeles City Directory 1899 shows: Lemmon Arabella (widow J. W.) r. 2120 Oak. William Reynolds Cushman Jr. was born July 22, 1899, in Portsmouth, NH. The 1900 U. S. Census taken on June 10, 1900, shows Orrin Abbey (age 85) born January 1815 in England to English-born parents is a widower and is living in Beaver Dam Precinct, Washington Co., OR. He cannot read or write, and is a Naturalized citizen of unknown immigration date. He is a Boarder living with a Farmer family of six named Hamel. Orrin Abbey was misspelled as Orrin Abber. 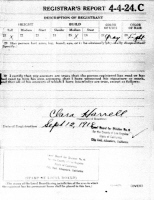 The 1900 U. S. Census taken on June 11, 1900, shows Charles F. Lemmon (age 22) born June 1877 in Idaho to Massachusetts-born parents is an unmarried Wine Merchant and is lodging at 530 Tenth Street, 5th Ward, City of Oakland, Alameda Co., CA. The 1900 U. S. Census taken on June 12, 1900, shows Marabella Lemmon (age 51) born September 1848 in Kentucky to Kentucky and Louisiana-born parents with 2 of the 3 children born to her still alive and married for 33 years is a Widowed head of household who owns her home with a mortgage and is living at 2120 Oak Street, 5th Ward, City of Los Angeles, Los Angeles Co., CA. Living with her are: her son-in-law, Charles H. Ritchie (age 28) born August 1871 in Michigan to Scottish and New York-born parents, who is in Advertising; and her childless newly-wed daughter, Bella F. Ritchie (age 29) born April 1871 in California to Virginia and Kentucky-born parents. Five Boarders and one Servant are also living in the household. The 1900 U. S. Census taken on June 15, 1900, shows John W. Lemmon (age 68) born August 1831 in Illinois to Virginia and Ohio-born parents is a Farmer who owns his farm free of a mortgage and is living in Beaver Dam Precinct, Washington Co., OR. Charles Fisher "Charlie" Ritchie was born June 13, 1900, in Pasadena, Los Angeles Co., CA. Elinor Agnes Close was born March 5, 1901, in New York City, NY. John Wesley Lemmon died October 23, 1902, in Portland, Multnomah Co., OR, at age 71. The 1910 U. S. Census taken on April 20, 1910, shows Charles F. Lemmon (age 32) born in Idaho to Illinois and Kansas-born parents is a married General Practice Dentist in his first marriage who is renting his home and is living on Ash Street, City of San Buena Ventura, Ventura Twp., Ventura Co., CA. Living with him is his wife of nine years, Isabel E. Lemmon (age 31) born in California to English Canadian-born parents and in her first marriage, with both of the children born to her still alive. Also living there are his two children, both born in California to Idaho and California-born parents: daughter, Jessie V. Lemmon (age 8); and Warren W. Lemmon (age 4). The 1910 U. S. Census taken on April 15, 1910, shows Charles H. Ritchie (age 38) born in Michigan to Scottish and Wisconsin-born parents is a widowed Wholesale Furniture Dealer who owns his home with a mortgage and is living at 833 Victoria Avenue, City of Ocean Park, Ballona Twp., Los Angeles Co., CA. Living with him is his wife of 12 years, Bella F. Ritchie (age 41) born in California to Maryland and Kentucky-born parents, and in her second marriage, with both of the children born to her still alive. Also living with him are: his son, C. Fisher Ritchie (age 9) born in California to Michigan and California-born parents; his son, Ralph S. Ritchie (age 4) born in California to Michigan and California-born parents; and his adopted daughter, Ruth Ritchie (age 4) born in California to St. Italian and United States-born parents. 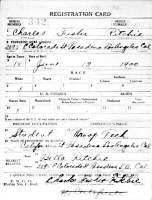 The September 12, 1918, WWI Draft Registration Report for Charles Fisher Ritchie. 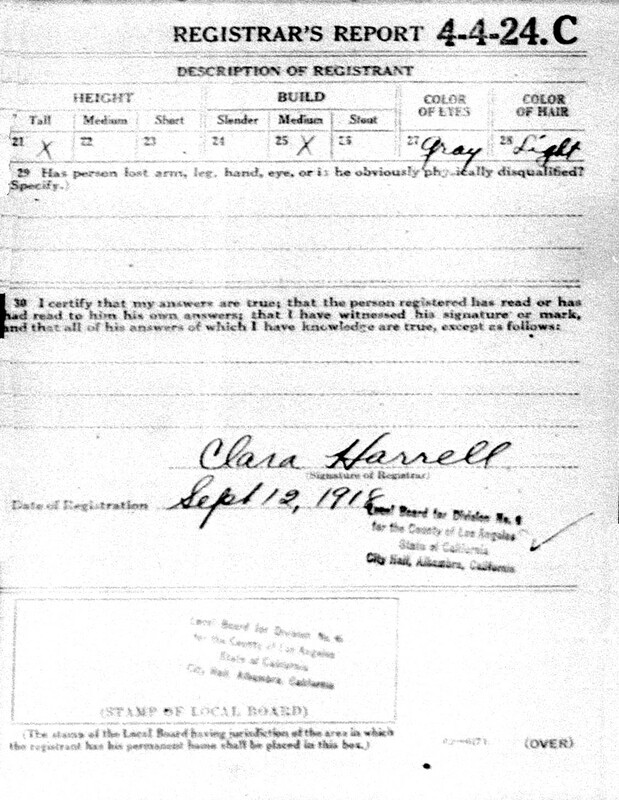 The 1920 U. S. Census taken on January 9, 1920, shows Charles H. Ritchie (age 48) born in Michigan to United States-born parents and in his first marriage is a married Commercial Traveler in Furniture who owns his home free of a mortgage and is living at 2095 East Street, Lamanda Dist., Pasadena Twp., Los Angeles Co., CA. 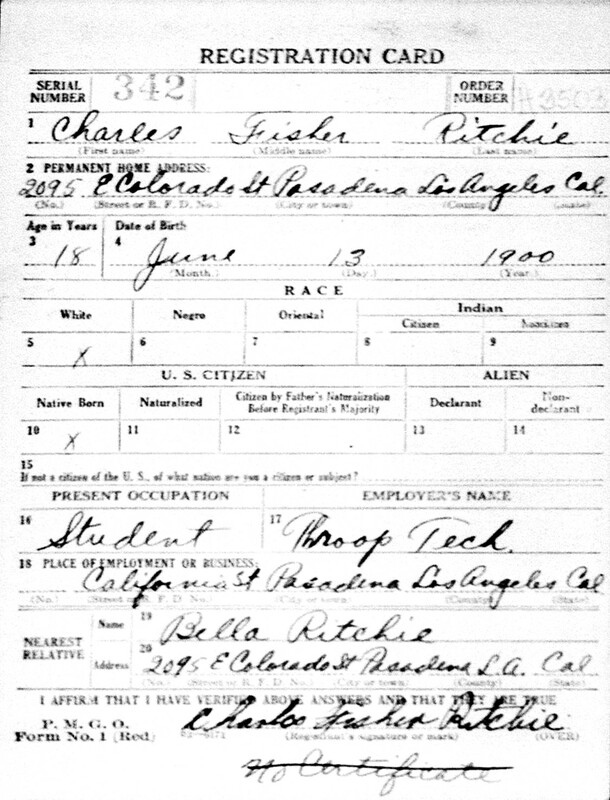 Living with him are: his unmarried son, Charles F. Ritchie (age 19) born in California to Michigan and California-born parents; his unmarried son, Ralph S. Ritchie (age 14) born in California to Michigan and California-born parents; and his unmarried daughter, Ruth Ritchie (age 13) born in California to Italian and United States-born parents. A widowed Housekeeper also lives in the household. The 1920 U. S. Census taken on January 5, 1920, shows Charles F. Lemmon (age 42) born in Idaho to Illinois and Missouri-born parents is a married Dentist with his Own Office who is renting his home and is living at 120 West Haley Street, 5th Ward, City of Santa Barbara, Santa Barbara Co., CA. Living with him is his wife, Isabel E. Lemmon (age 40) born in California to English Canadian-born parents. Also living there are his two unmarried children, both born in California to Idaho and California-born parents: daughter, Jessie V. Lemmon (age 18); and Warren W. Lemmon (age 14). The 1930 U. S. Census taken on April 7, 1930, shows Dr. Charles F. Lemmon (age 51) born in Idaho to Illinois and Missouri-born parents is a married Dentist on his Own Account who owns his home worth $15,000 and is living at 2325 Wellington Avenue, 5th Ward, City of Santa Barbara, Santa Barbara Co., CA. Living with him is his wife, Isabelle Lemmon (age 51) born in California to English Canadian-born parents. Also living there are his two unmarried children, both born in California to Idaho and California-born parents: daughter, Jessie Lemmon (age 28), a School Teacher; and Warren Lemmon (age 24), an Artist on his Own Account. The 1930 U. S. Census taken on April 10, 1930, shows Charles H. Ritchie (age 58) born in Michigan to Scottish and Canadian-born parents and first married at age 28 is a widowed Furniture Salesman who owns his home valued at $25,000 and is living at 506 Orange Grove Avenue, South Pasadena, San Gabriel Twp., Los Angeles Co., CA. Living with him is a divorced Housekeeper, Bertha Norris (age 56) born in Pennsylvania to Pennsylvania-born parents and first married at age 22, a Housekeeper in a Private Home. The 1930 U. S. Census taken on April 30, 1930, shows Ralph S. Ritchie (age 29) born in California to Michigan and California-born parents and first married at age 21 is a Phonograph Recording Office Manager who owns his home valued at $30,000 and is living at 1429 26th Street, Santa Monica, Los Angeles Co., CA. Living with him is his wife, Irene Ritchie (age 28) born in Iowa to Michigan and Iowa-born parents and first married at age 16. The 1930 U. S. Census taken on April 8, 1930, shows Charles F. Ritchie (age 29) born in California to Michigan and California-born parents and first married at age 27 is a Chemical Engineer at a Chemical Manufacturer who rents his home for $17.50/month and is living at 5 Magnolia Avenue, Trona, Trona Twp., San Bernardino Co., CA. Living with him is his wife, Dorothy M. Ritchie (age 32) born in New York to New York and Illinois-born parents and first married at age 32. Also living there is his daughter, Carol F. Ritchie (age 9/12) born in California to California and New York-born parents. A Trained Infant Nurse also lives in the household. Funeral rites will be conducted at 1:30 p.m. tomorrow for Charles H. Ritchie, 64 years of age, Southern California furniture man, who died of heart disease Tuesday at his home, 506 Orange Grove Avenue, South Pasadena. Services will be conducted from Cabot's Funeral Parlor, 27 Chestnut street, Pasadena, and interment in Hollywood Cemetery will follow. He leaves his widow, two sons, Ralph H. and Fisher Ritchie, and a sister, Mrs. Nellie Johnson. '94 ME - Ralph Tomkins Close, early in February, at the home of his daughter, Elinor A. Close Cushman '11, in San Luis Rey, Calif. For some years he was superintendent of the Consolidated Gas Company of New York, then with the Westinghouse Construction Company, and was one of the seventeen Cornellians who in 1930 were associated with the Philadelphia, Pa., office of United Engineers and Constructors, Inc. He built the railroad terminal in the business center of Alberta, Can. Son, Ralph T. Close, Jr. '30. In 1937, Ritchie, C. F. - Assistant Director of Research, American Potash and Chemical Company, Trona, California. Class of 1922, 15 years after graduation from Cal Tech. The 1940 U. S. Census taken on May 20, 1940, shows Charles Ritchie (age 39) born in California, and 5 years ago was living in the Same Place, and with 4 years of College, is a married Director at APCC who is renting his home for $35/month and is living in Trona, San Bernardino Co., CA. Living with him are: his wife, Dorothy Ritchie (age 44) born in New York, and 5 years ago was living in the Same Place, and with 4 years of College; his daughter, Carol Ritchie (age 10) born in California, and 5 years ago was living in the Same Place, and with 5 years of School; his son, Douglas Ritchie (age 4) born in California; his wife's mother-in-law, Mabelle Murray (age 67) corn in Illinois, and 5 years ago was living in the Same Place, and with 4 years of High School; his father-in-law, Henry T. Murray (age 67) born in Illinois, and 5 years ago was living in the Same Place, and with 4 years of High School. In 1941, Warren Lemmon was still an Artist living with his parents in Santa Barbara, CA. In January, 1945, Charles Fisher "Charlie" Ritchie joined the Mallinckrodt Chemical Works in St. Louis, MO, and shortly afterward was assigned to "The Project." meaning the refining of uranium ores to molecular-weight purity salts and metal on a large-scale basis. Charles Fisher "Charlie" Ritchie died April 13, 1953, in Saint Louis, MO, at age 52. RITCHIE, CHARLES FISHER, 217 Westgate, Mon, April 13, 1953, husband of Elinor C. Ritchie, father of Carol Ritchie Campagnet and Douglas Grant Ritchie. Mr. Ritchie at LUPTON Chapel, 7233 Delmar bl. Services at St. Michael and St. George Church, Ellenwood and Wydown bls, Fri., 10 a.m.
RITCHIE, Charles Fisher, at St. Louis, Mo., on Monday, April 13, 1953, husband of Elinor C. Ritchie, father of Carol Ritchie Campagnet and Douglas Grant Ritchie. Services at St. Michael and St. George's Church, Ellenwood and Wydown Boulevard, St. Louis, Friday, 10 a.m.
New on the list of June brides-elect is Miss Margaret Wright, former Las Damas Ball debutante, whose betrothal to Douglas Grant Ritchie is announced by her parents, Mr. and Mrs. Duncan Graham Wright. Miss Wright will be graduated from Immaculate Heart College before her wedding June 9. Two years ago she toured Europe, stopping at Alticry Manor, Wigtownshire, Scotland, ancestral home of her father's family. Mr. Ritchie is the son of Mrs. Charles Fisher Ritchie of Escondido and the late Mr. Ritchie, who was an alumnus of Caltech where his son is now a student. 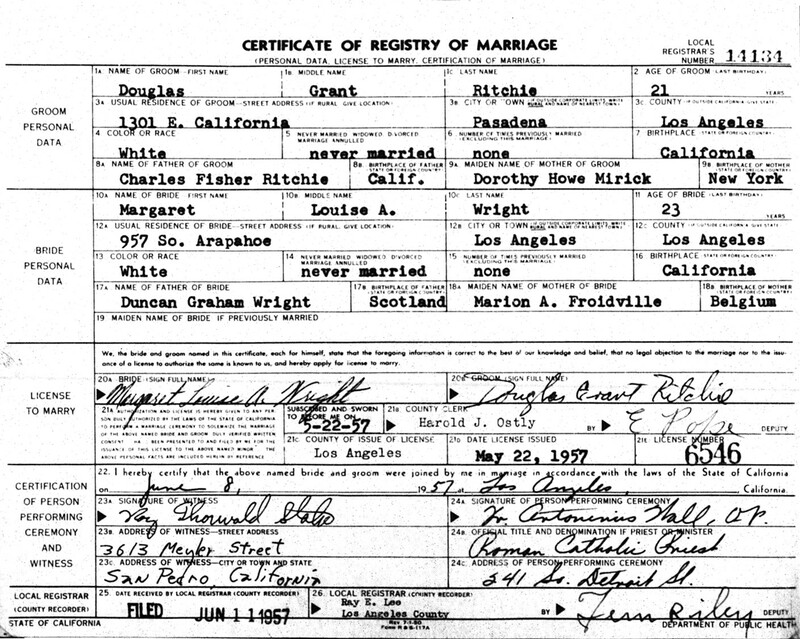 Douglas Grant Ritchie and Margaret Louise A. Wright were married June 8, 1957, in Los Angeles Co., CA. 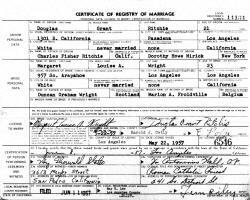 Douglas Grant Ritchie and Margaret Louise A. Wright Marriage Registry. RITCHIE, Ralph S., beloved husband of Florence I. Richie, father of Mrs. Florence J. Clayton. Services at 3 p.m. Monday, Church of the Hills, Forest Lawn-Hollywood Hills. Forest Lawn Mortuary. A leading lawyer of the San Diego bar with a large practice, William Reynolds Cushman was born in Darmstadt, Germany, April 9, 1875. His father was Charles G. Cushman, a commander in the United States navy, who married Nannie M. Stewart, a representative of the distinguished family of that name of Maryland and the last lineal descendant of the famous Peggy Stewart. After the retirement of his father and the establishment of the family home in Buffalo, New York, William R. Cushman attended the public schools there, winning the "Jesse Ketchum" medal. In 1891 he was appointed from the thirty-second New York district to the United States Naval Academy by the Hon. Daniel N. Lockwood. He served from 1891 until 1908 as a naval officer and in the latter year was retired with the rank of lieutenant. After entering the naval academy in 1891 he mastered the regular four years' course and was graduated with credit in 1895. Assigned to duty on one of the naval ships, he was at the coronation of Tsar Nicholas in 1897. The same year he passed his final examination and was commissioned an ensign. The following year he saw active duty, for the war with Spain had been inaugurated, and he was attached to the Indiana and other vessels of Admiral Sampson's fleet and now holds the United States medals for the Spanish-American war and the Cuban campaign. In 1900 he was commissioned a lieutenant of the junior grade, in 1902 was commissioned lieutenant and thus continued until 1908, when he retired. Upon his retirement he studied law under the Chicago Correspondence School of Law and was admitted to practice in January, 1911. On the 29th of August, 1911, he was named as one of the pilot commissioners for San Diego harbor. Although his identification with the legal profession here covers but a brief period he has made rapid progress and his analytical power, his careful preparation of cases and his clear and forceful presentation of his cause have been the factors in his growing success. Upon the 12th of March, 1898, Mr. Cushman was married at Dry Tortugas (old Fort Jefferson), Florida, to Miss Marie Caraher, a daughter of Major A. P. Caraher, of the United States army, who served as a volunteer during the Civil war and later in the regular army. Mr. and Mrs. Cushman have become the parents of two children: William Reynolds, Jr., a high-school student; and Philip Caraher. Marion Frances (Froidville) Wright died February 18, 1994, at Desert Springs Hospital, Las Vegas, Clark Co., NV, at age 94. Buried in Calvary Catholic Cemetery and Mausoleum, Sacramento, Sacramento Co., CA. Marion F. Wright, a native of Liege, Belgium, and a 1983-88 resident of Carmichael, Died Friday at Desert Springs Hospital in Las Vegas, Nev. She was 94. Mrs. Wright moved to Los Angeles in 1928 and had lived in Las Vegas since 1991. She was a homemaker. Visitation will be from 9 to 11 a.m. Wednesday at Cochrane's Chapel of the Roses, 103 Lincoln St. in Roseville. A Mass of Christian Burial will be celebrated at 11 a.m. Wednesday at Calvary Cemetery Chapel, 7101 Verner Ave. in Sacramento. The Rev. Anthony Harlan of the St. Rose Catholic Church in Roseville will officiate. Burial will be in Calvary Cemetery in Sacramento. 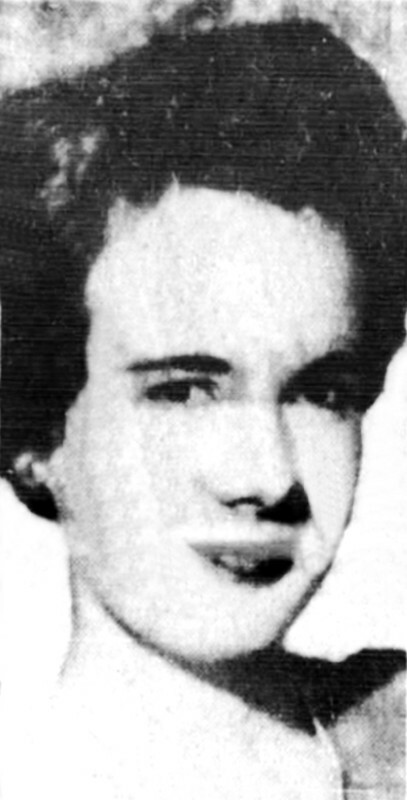 Mrs. Wright is survived by her daughter, Margaret Ritchie and her husband Douglas of Seattle, Wash.; a son, Duncan G. Wright and his wife Adrianne of Las Vegas, Nev.; 13 grandchildren, Mark Ritchie and Steve Wright of Los Angeles, Doug Ritchie, Elizabeth Ritchie, Christopher Ritchie and Mimi Ritchie, all of Seattle, Wash., William Wright of Loomis, Robert Wright of Chicago, Ill., John Wright of Vancouver, Canada, Richard Wright of Sacramento, and Jennifer Wright of Palo Alto, and Suzanne Wright and Michelle Wright of Las Vegas, Nev.